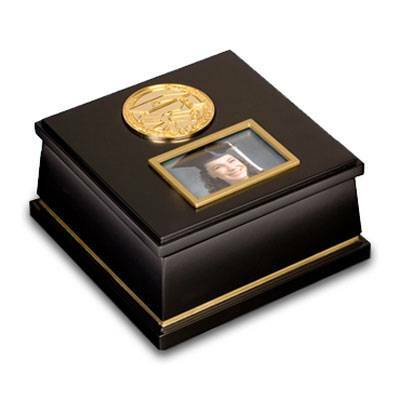 Features gold baccalaureate medallion, 3x 2 photo frame on top and velvet lining. Tune: Pomp and Circumstance Dimensions: 6 1/2 X 6 1/2 X 3 1/2. The San Francisco Music Box's goal is to be the premier musical giftware specialist, providing customers with products of exceptional quality, sentiment and creativity. The San Francisco Music Box is a leading purveyor of quality musical gifts, music boxes, waterglobes, figurines and much more.